I’m not a big cake person. I never have been, besides the box mix chocolate yellow cakes my mom would make for me when I was a child, but I’d have taken any form of sugar I could get in my younger years. I also adore cheesecake. But when it comes to classic, American layer cakes with buttercream and all the fixings… Not my favorite. (Sorry, Cakeboy, still love you xo). They’re just too sweet for me! I constantly seek balance in my baked goods: if “sugar” is the only flavor I’m getting, I’ve failed. For that reason, and from past chefs’ constant instruction, I also use a lot more salt than most people. When I do go for cake, it’s usually a loaf of some sort. Probably with citrus... If I’m lucky, perhaps buttermilk and a handful of cornmeal as well. Basically, this loaf cake recipe I’m sharing right now. Hehe. I avoid powdered sugar glazes if I can, because they’re super sugary. For this cake, I opted for a whipped cream with a few tablespoons of mascarpone, which help it hold longer. If you’re serving immediately, I’d slice it warm and top it with a dollop of the whipped cream. If you want extra credit and/or want to learn to candy citrus, follow the short recipe at the end of this post for a delicious, jewel-like garnish. A few tips for success: Proper creaming of the butter and sugar will ensure the cake is fluffy. This loaf is on the denser side and doesn’t rise too much, which is good since we’re going to invert it from the pan for decorating. To get the perfect butter consistency, slice it up and lay it flat on a piece of parchment for 5 to 10 minutes (it shouldn’t be melting, but more softened). Room temperature ingredients will help for smooth mixing and no broken batters, so take out the eggs and buttermilk first! Also, lining the loaf pan both ways will ensure your beautiful cake doesn’t get stuck. 1. Preheat oven to 325° F and line a standard sized loaf pan (8.5” x 4.5”) with parchment paper and baking spray. Set aside. 2. In a medium-sized bowl, sift together flour, baking soda, and cornmeal (remove any leftover large particles). Set aside. 3. In bowl of stand mixer, combine sugar, salt, and lemon zest. Rub the zest in with your fingertips to distribute evenly. Add softened butter to the bowl and fix the paddle attachment to your stand mixer. Cream for 3 to 5 minutes on medium speed, until the mixture is fluffy and pale. 4. Continue mixing on medium high speed and gradually add eggs one by one. Once you’ve added two of the eggs, stop the mixer, scrape the bottom of the bowl very well, and continue. Add the final egg and the yolk and continue mixing until well combined. 5. In a measuring cup, combine lemon juice and buttermilk. With mixer turned off, add half of the flour and cornmeal mixture to the bowl. Mix on low speed while also pouring in half of the buttermilk. Stop before fully combined. Add the remaining dry ingredients and mix on low speed again while pouring in the rest of buttermilk. Keep mixing just until no more flour streaks remain — do not over mix! 6. Add the batter to the lined loaf pan and bake for 25 minutes. When the time is up, carefully rotate the pan and continue baking another 25 minutes. To check for doneness, carefully poke the surface of the cake. If it rises back slowly, your cake is done! Cool completely and flip over before decorating. If you have some on hand, now is a good time to brush the cake with simple syrup! (Quick syrup soak: boil 1/2 cup sugar, 1/2 cup water, and juice of one lemon until sugar is melted). 7. To make the whipped cream, add the mascarpone to the bowl of a stand mixer fixed with the whisk attachment. Turn on low speed and add a small amount of the whipping cream (and vanilla bean/paste if using). Allow this to break up and smoothen out the mascarpone. Once it’s no longer in large chunks, add the remaining cream and turn the speed up a notch every minute or so until your cream is stiffened to your liking. At this point, add powdered sugar and vanilla extract (if using) and fold together with a spatula. 8. To decorate, fill a piping bag with the whipped cream. Try piping swirls, stars, and bubbles — or just spread it on top with a spoon! 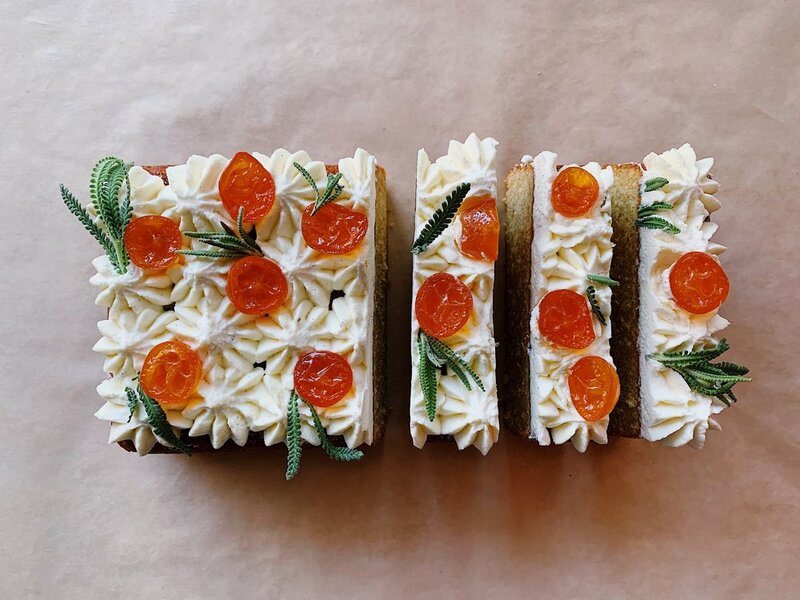 I topped mine with candied kumquats and fresh lavender. You could use a combination herbs, citrus zest, berries, and more to personalize yours. This cake is best served day of, but an unfrosted loaf will keep for 5 days if wrapped airtight, and longer in the freezer! The decorated cake will hold in the fridge for a few hours. Notes: This recipe takes a little patience and watchful eye, but it’s sooo worth it! If your syrup starts to reduce too much during the process, add a 1/2 cup of water or so. 1. Cut any woody ends of the kumquats off, then slice all of them in half (through the middle, not from end to end) and remove all of the seeds. I use culinary tweezers to get them out. 2. In a medium sized pot, add the kumquat halves and cover with an inch of cold water. Bring to a boil on the stove, and immediately turn off the heat. Strain the kumquats, add back to the same pot, and cover with cold water again. Repeat the blanching process until you’ve done it 3 times. This helps soften up the citrus rind and make them a little more palatable. 3. Strain the kumquats a final time and set aside. In the pot, add 2 1/2 cups of water plus 1 1/2 cups sugar. Bring to a boil. Reduce to a simmer and add the kumquats back to the pot. Simmer on the lowest heat possible, uncovered, for 45 minutes to 1 hour. To test, remove a kumquat from the pot with a fork and run under cold water until cooled enough to eat. If it is softened enough for you, you’re good to remove from heat and cool completely in the pot. If it needs a bit longer, let it keep cooking and check every 10 minutes or so. Store the candied kumquats in the simple syrup they were cooked in.